Hi, I’m interested in MAN TGA RADIATORS. Please contact me. Thanks! Reliable Second hand parts and spares Available parts and spares in stock: Man tga cylinder head, cummins injectors, Man tga d26 edc ecu box, jost fifth wheel, brand new delco remy starter, Man tga d28 engine ecu box, benz starter motor om352-355, cummins isx and detroit starter motor, filter and water separators, ZF-astronic ecu box, volvo gear lever, eaton ECM box for gearbox, Man tga water separator, isx cummins cm 500/530/570 ecm, Man and benz tail lights and headlights, Iveco Stralis 480/430 starter motor, volvo d12 starter motor, volvo fh12 diesel injectors, Man m2000 high pressure pump, benz actros mp1 complete airokit, Man tga ebs, Man tga ffr, volvo fh12 air filter, Isx gen3 xy shift, isx 500/530 crankshaft, Man tga d20 reconditioned diesel injectors, Man tga d20 common rail ecu box Man tga common rail injector pump, Man tga 410 lf32 block, Nissan diesel 440 manual gearbox and ud 440 cylinder head, Man 26.410 lf 25 crankshaft and block Tipper bins, Man tga radiators and intercoolers, Benz v8 pistons, f2000 engine, Man water pump, used grills and doors, ade v8 engine and zf astronic gearbox. We also outsource engine parts and body parts. Cabs for all trucks also available. 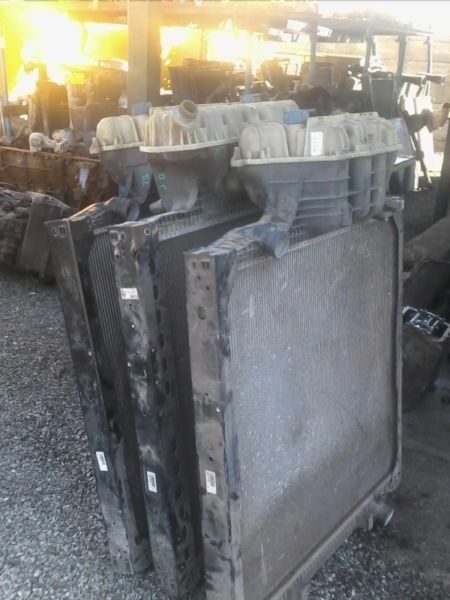 In Good Working Condition MAN TGA 26.410, 440 and 480 Radiators On Sale!! MAN TGA SECONDHAND ENGINE PARTS RELIABLE SUPPLIERS!! STOCK: Engines, Gear boxes, Starter motors,Inter-coolers, Radiators ,Turbo chargers, Air compressors, Injectors, Water pumps, Viscous fans, gear levers and lots more for variate of makes. 3x MAN TGA 26.400 D20 common rail stripping for Spares! !